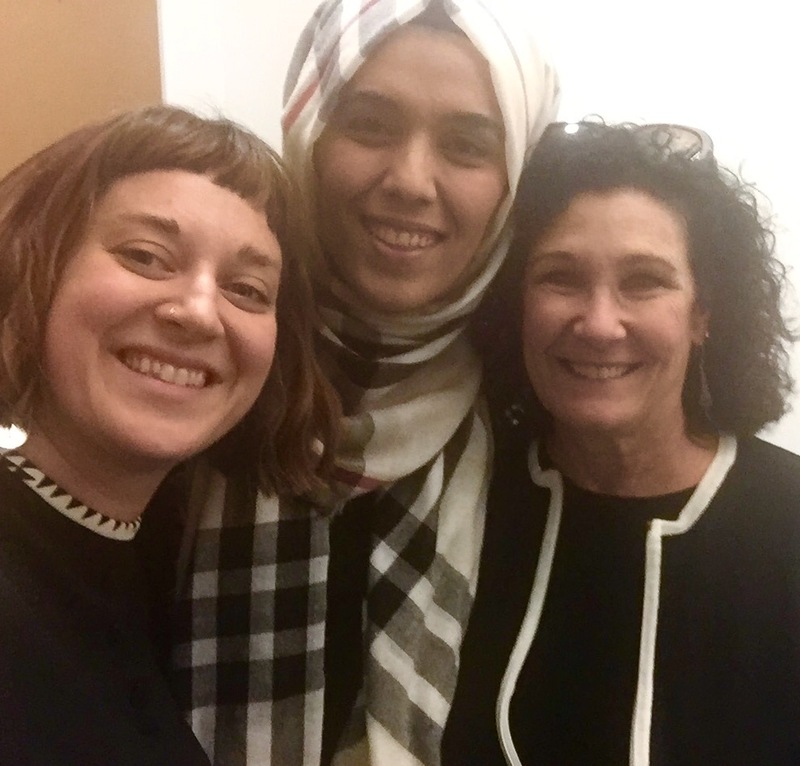 From left to right: Picture Me Here mentor Meredith Turk, program fellow Gulsum Katmir, and Writing for Peace president Andrea Doray. Gulsum is also director of the Mosaic Foundation, an interfaith alliance in Denver, CO.
One Friday night recently, I was in Nigeria, Ethiopia, and Ukraine. I smelled the jasmine and heard the mourning doves of Syria. I savored lunch in Afghanistan. I felt buildings collapse in Mexico, and witnessed the capture of a terrorist in Iraq. I visited a hospital, an airport, and a high school hallway. I met siblings and parents and grandparents, and felt the loss of those who are gone. Why was I so fortunate? Because I am mentoring writers in a fellowship from Picture Me Here, a storytelling program in Denver, Colorado, USA, for refugees, immigrants and others who have been displaced. The Picture Me Here program uses writing, audio, and video to help people explore their cultural and artistic identities through their stories of migration, memory, and place. That Friday evening, these fellows debuted the audio versions of their first stories. I was partnered with two young women to mentor them through writing these stories: Sunday, of Burmese descent, and Gulsum, from Turkey. Gulsum, 30, and her husband came to the United States 10 years ago to get their master’s degrees (hers in economics from Penn State), never intending to stay here. In her recorded story on Friday, she recalled receiving a phone call from her husband with news of the 2016 attempted coup in Turkey. In that moment, she knew she could never go home. In her story, Gulsum said: “Unfortunately, the [government’s] scapegoat was the social movement called Hizmet – [whose members] believe in peace all around the world and promote interfaith dialogue – declared as the enemy of the Turkish state … My worries were because we were planning to go back to Turkey and I am [part] of the Hizmet movement [and President] Erdogan now could do anything to [us].” Gulsum knows she will be jailed upon her return, even if just to visit her parents. Like the rest of us at Writing for Peace, I am deeply committed to our mission to cultivate – through education and creative writing – the empathy that allows us to value our diversities and differences as well as the hopes and dreams that unite all of humanity. Through Sunday’s and Gulsum’s intensely personal stories – and the stories of the young Ethiopian man who had to wait 10 years to bring his mother here, the Iraqi man who had worked with the U.S. military there, the siblings from Afghanistan who cried when they remembered their grandfather, and the young woman from Syria who contrasted her life from before and during the war – I felt the empathy swell in me and the others in the room, uniting us in common hopes and dreams. In moments like these, I truly believe peace is achievable. And that’s how I see it … from my little corner of the world. Andrea W. Doray is an award-winning journalist, author, poet, and essayist in Denver, CO, and is occasionally a columnist for The Denver Post through their Colorado Voices panel. Her weekly opinion column, Alchemy, which appears in Colorado Community Media newspapers, has received a first-place award from the Colorado Press Association. Learn more about Andrea and her work here. More senseless tragedies in America; more assault weapons used to kill and maim the most innocent among us. We feel increasingly impotent, searching for something we can do that will make an impact. Of course, we can never eradicate violent behavior; humans are imperfect. But we are NOT helpless to change the multiplier—the gun. Gun safety laws fail to pass at the Federal level because a relatively few people, primarily through the NRA, give a lot of money to fund political campaigns. But your vote can weigh more than their money. When thousands of constituents vow to withhold votes, NRA-funded legislators’ loyalty waivers. We have the numbers: the vast majority of Americans, including many NRA members, support reasonable gun safety laws. Your call matters. Your email matters. Most people keep silent. Most gun legislation today is done at the state and local level. This is where you can have the most influence. Use the Gun Law Navigatorto learn generally about your state’s gun laws. Find out what laws are on the books in your state, and call or write your local representative to express your opinion. How do you find out? Google local chapters of MomsDemandAction OR the Brady Campaign OR simply “gun safety advocate [your state].” In Colorado, for example, we have www.coloradoceasefire.org, as well as branches of the national advocacy groups listed above. Colorado Ceasefire is a one-stop-shop for information. It lists upcoming legislation, legislator voting records and NRA ratings, and actions you can take. Most of these groups also have email alerts; sign up. Act when asked. Volunteer, either for a gun safety advocacy group, or for the political campaign of someone who supports gun safety. We need you in 2018, desperately. We can’t change the Federal laws until we change the people who refuse to enact reasonable gun-safety legislation. This entry was posted in Activism, Board Contributors, Gun Violence, President's Corner and tagged Andrea Doray, Empathy, Gun control, Gun violence, Jody Rein. Bookmark the permalink.